"And what did ye look they should compass? at the first far view of Death?" - KIPLING. I suddenly found myself dumped down at Duffer’s Drift with the same orders as already detailed, and an equal detachment composed of entirely different men. As before, and on every subsequent occasion, I had ample stores, ammunition, and tools. My position was precisely similar to my former one, with this important exception, running through my brain were four lessons. As soon as I received my orders, therefore, I began to make out my plan of operations without wasting any time over the landscape, the setting sun, or the departing column, which, having off-loaded all our stores, soon vanished. I was determined to carry out all the lessons I had learnt as well as I knew how. To prevent any strangers, friendly or otherwise, from coming into my position and spying out the elaborate defenses I was going to make, I sent out at once two examining posts of one NCO and three men each, one to the top of Waschout Hill, and the other some 1000 meters out on the veld to the north of the drift. 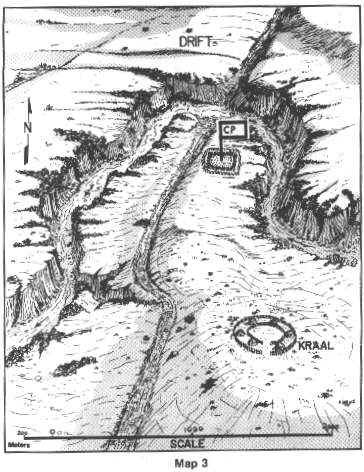 Their orders were to watch the surrounding country, and give the alarm in the event of the approach of any body of men whatever (Boers were, of course, improbable, but still just possible), and also to stop any individuals, friendly or not, from coming anywhere near camp and to shoot at once on non-compliance with the order to halt. If the newcomers had any provisions to sell, these were to be sent in with a list by one of the guard, who would return with the money, but the strangers were not to be allowed nearer the camp on any account. Having thus arranged a safeguard against spies, I proceeded to choose a camping ground. I chose the site already described in my former dream, and for the same reasons, which still appealed to me. So long as I was entrenched, it appeared the best place around. We started making our trenches as soon as I had marked off a nice squarish little enclosure which would about contain our small camp. Though, of course, the north was the front, I thought, having a camp, it would be best to have an all-round defence as a sort of obstacle. The majority of the men were told off to dig, which they did not relish, a few being detailed to pitch camp and prepare tea. As the length of trench was rather great for the available number of diggers, and the soil was hard, we were only able by dark, by which time the men were quite done up by their hard day, to make quite a low parapet and shallow trench. Still we were "entrenched," which was the great thing, and the trench was all round our camp, so we were well prepared, even should we be attacked during the night or early next morning, which was quite unlikely. During this time one or two strangers had approached the guard of the north from a farm under Incidentamba. As they had eggs and butter, etc., to sell, these were brought in as arranged for. The man sent in with the stuff reported that the elder of the Dutchmen was a most pleasant man, and had sent me a present of a pat of butter and some eggs, with his compliments, and would I allow him to come in and speak to me? However, not being such a fool as to allow him in my defenses, I went out instead, in case he had any information. His only information was that there were no Boers anywhere near. He was an old man, but though he had a museum of "passes," I was not to be chloroformed by them into confidence. As he seemed friendly, and possibly loyal, I walked part of the way back to his farm with him, in order to look around. At dark the two examining posts came in, and two guards were mounted close by the object I was to watch, namely, the drift, at the same places as in my previous dream. This time, however, there was no half-hourly shouting, nor were there any fires, and the sentries had orders not to challenge but to shoot any person they might see outside camp at once. They were placed standing down the river bank, just high enough to see over the top, and were thus not unnecessarily exposed. Teas had been eaten, and all fires put out at dusk, and after dark all turned in, but in the trenches instead of in tents. After going round sentries to see everything snug for the night, I lay down myself with a sense of having done my duty, and neglected no possible precaution for our safety. Just before dawn much the same happened as already described in my first dream, except that the ball was started by a shot without challenge from one of our sentries at something moving among the bush, which resulted in close-range fire opening up to us from all sides. This time we were not rushed, but a perfect hail of bullets whistled in from every direction-from in front of each trench, and over and through our parapet. It was sufficient to put a hand or head up to have a dozen bullets through and all round it, and the strange part was, we saw no one. As the detachment wag plaintively remarked, we could have seen lots of Boers, "if it wasn’t for the bushes in between." After vainly trying until bright daylight to see the enemy in order to do some damage in return, so many men were hit, and the position seemed so utterly hopeless, that I had to hoist the white flag. We had by then 24 men killed and six wounded. As soon as the white flag went up the Boers ceased firing at once, and stood up; every bush and ant-hill up to 100 meters range seemed to have hid a Boer behind it. This close range explained the marvelous accuracy of their shooting, and the great proportion of our killed (who were nearly all shot through the head) to our wounded. As we were collecting ourselves preparatory to marching off there were one or two things which struck me; one was that the Dutchman who had presented me with eggs and butter was in earnest confabulation with the Boer commandant, who was calling him "Oom" most affectionately. I also noticed that all male Kaffirs from the neighbouring kraal had been fetched and impressed to assist in getting the Boer guns and wagons across the drift and to load up our captured gear, and generally do odd and dirty jobs. These same Kaffirs did their work with amazing alacrity, and looked as if they enjoyed it; there was no "back chat" when an order was given—usually by friend "Oom." Again, as I trudged with blistered feet that livelong day, did I think over my failure. It seemed so strange, I had done all I knew, and yet, here we were, ignominiously captured, 24 of us killed, and the Boers over the drift. "Ah, BF, my boy," I thought, "there must be a few more lessons to be learnt besides those you already know." In order to find out what these were, I pondered deeply over the details of the fight. The Boers must have known of our position, but how had they managed to get close up all round within snapshooting range without being discovered? What a tremendous advantage they had gained in shooting from among the bushes on the bank, where they could not be seen, over us who had to show up over a parapet every time we looked for an enemy, and show up, moreover, just in the very place where every Boer expected us to. There seemed to be some fault in the position. How the bullets seemed sometimes to come through the parapet, and how those that passed over one side hit the men defending the other side in the back. How, on the whole, that "natural obstacle," the river-bed, seemed to be more of a disadvantage than a protection. 5. With modern rifles, to guard a drift or locality does not necessitate sitting on top of it (as if it could be picked up and carried away), unless the locality is suitable to hold for other and defensive reasons. It may even be much better to take up your defensive position some way from the spot, and so away from concealed ground, which enables the enemy to crawl up to very close range, concealed and unperceived, and to fire from cover which hides them even when shooting. It would be better, if possible, to have the enemy in the open, or to have what is called a clear "field of fire." A non-bullet-proof parapet or shelter which is visible serves merely to attract bullets instead of keeping them out—the proof of thickness can be easily and practically tested. When fired at by an enemy at close range from nearly all round, a low parapet and shallow trench are not of much use, as what bullets do not hit the defenders on one side hit those on another. 6. It is not enough to keep strange men of the enemy’s breed away from your actual defenses, letting them go free to warn their friends of your existence and whereabouts—even though they should not be under temptation to impart any knowledge they may have obtained. "Another way," as the cookery book says, more economical in lives, would be as follows: Gather and warmly greet a sufficiency of strangers. Stuff well with chestnuts as to the large force about to join you in a few hours; garnish with corroborative detail, and season according to taste with whiskey or tobacco. This will very likely be sufficient for the nearest commando. Probable cost—some heavy and glib lying, but no lives will be expended. 7. It is not business to allow lazy men (even though they be brothers and neutrals) to sit and pick their teeth outside their kraals whilst tired soldiers are breaking their hearts trying to do heavy labour in short time. It is more the duty of a soldier to teach the lazy neutral the dignity of labour, and by keeping him under guard to prevent his going away to talk about it. By the time the above lessons had been well burnt into my brain, beyond all chance of forgetfulness, a strange thing happened. I had a fresh dream.